There are currently 91,372 users on this website. It made me wonder, how long did this get circulated before it was found. Every now and again I still find 1968 and 1969 dimes in my change and they rarely look as beat up as this. I wonder if this is a recent circ find. I'm still looking to find one.At least the reverse on that one isn't scarred up. I assume it is in an ICCS holder? What did they grade it as? Here's a very cool story of the hunt for the elusive large date. Do'es anyone have the confirmed number to date of these, as I believe this was written some time ago. Great spirits have always encountered violent opposition from mediocre minds. "Einstein"
I am not sure if Peter Degraaf is still active in the Coin World or not. Peter was very active in Ottawa when I was younger. He traded quite a lot of coins with my aunt and was also around when my grandfather was active in the Coin World. I last heard from him around 10 years ago when I sold him a bulk lot of bullion coins. Based on my somehwat limited knowledge, I doubt that Peter was sitting on a hoard of 69 large dates and was trying to manage the price up. I suspect he just wanted one. That was a great read! So the one up for sale at torex, is that one of the 3 known? Or is it maybe a 4th that somehow managed to elude every dealer/collector out there. A few old timers truly believe due to who owned at one time all the 36 dots and the friendship with the mint master that they were a custom created. The large date 69 dime only one ms rest are really circulated tends to believe maybe a trial die and a few strikes that joined into regular circulation, maybe a honest mistake. looks to have been circulated, the 'scratch' on the obverse I believe comes from a parking meter. I'll bet there still are a few in circulation yet. 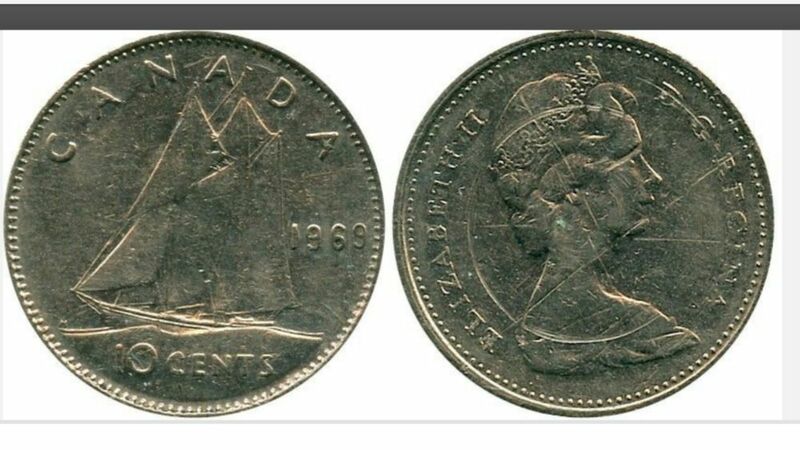 It's everybody's dream to buy a coffee at Tim's and receive a 69 LD in their change. Someone posted on the forum that he was given one as a child, and decided that a candy bar was more important at the time.